Are you having trouble converting measurements? Check our conversion chart. CUT the chorizo sausage in small slices using the small knife and cutting board. DICE the onion and roughly chop the tomatoes in chunks. WASH the mussels under running cold water. REMOVE any debris such as sea weed and sand. SEPERATE the bad mussels from the good ones, place the good ones into the large bowl. PLACE the mussels pan on medium-high heat. ADD in the chorizo, without any butter or olive oil and let it bake for 3 minutes. ADD in the diced onion and sauté until the onions are soft. ADD tomato chunks, bay leaf, white wine and chili flakes. TURN up the heat to maximum and let boil until most of the moisture has been evaporated. ADD in the (cleaned) mussels into the pan with the chorizo mixture. 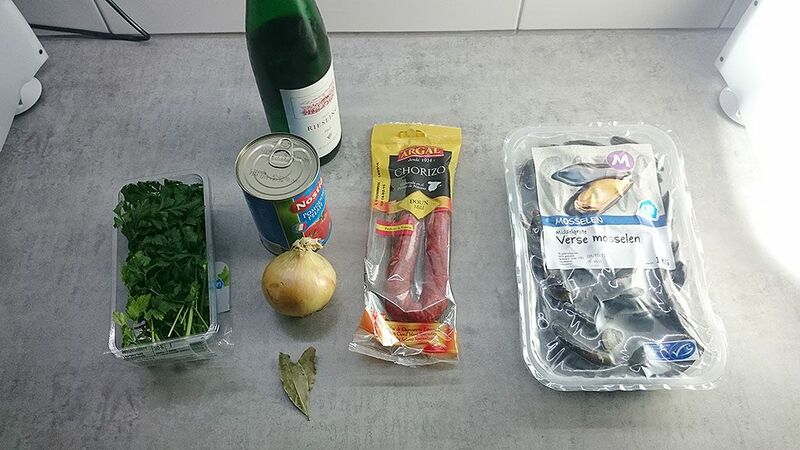 PLACE the lid on the pan and cook the mussels for just 5 minutes. 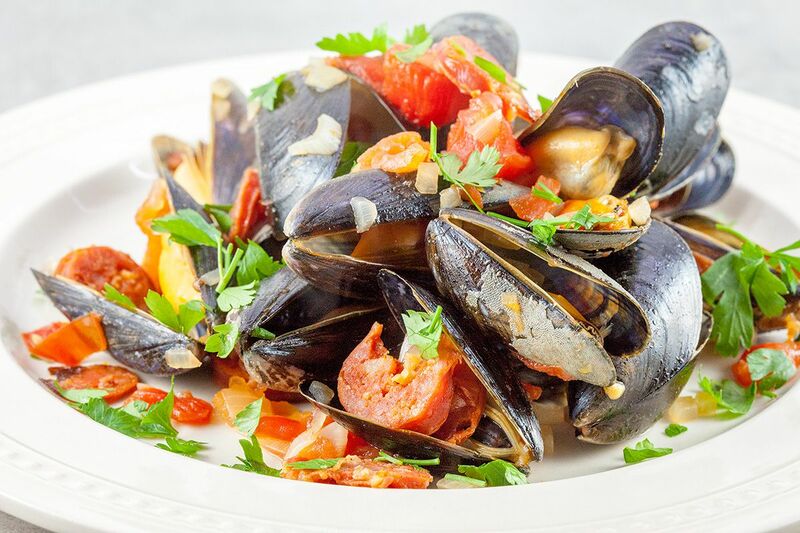 It really does not need more cooking time, that’s why mussels make a great weekday meal! Shake the pan using the oven mitts, while keeping the lid on tight using your hands. This might require a little practice. If you are unsure on shaking the entire pan, quickly turn the mussels over using a wooden spoon. 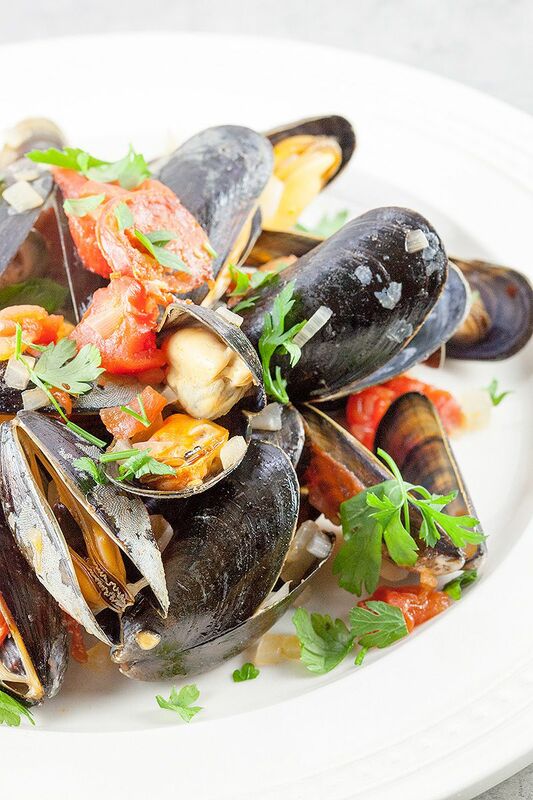 SERVE mussels in a deep plate. 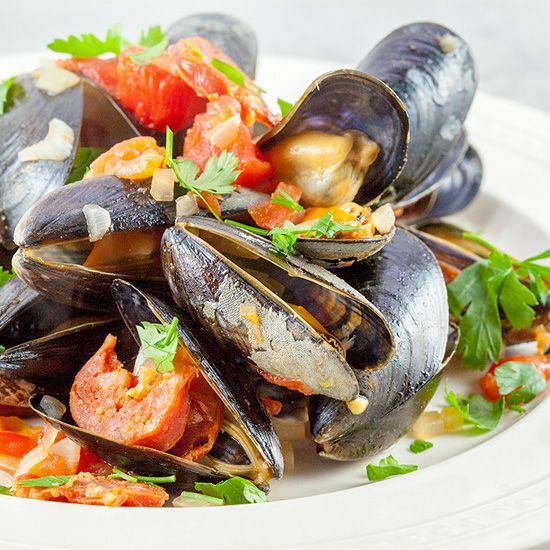 CHOP up the flat leaf parsley and divide over the mussels, and dig in!